100 years ago today was the watershed 1913 women's suffrage march. It's the perfect moment to reflect on the strategies and tactics of amazing suffragettes. We all know that the suffragettes won in the end by securing the vote for U.S. women in 1920. But to stop with that fact is to miss the phenomenal, inspirational, often nail-biting and groundbreaking campaign that preceded their win, as well as the lessons they have for activists today. Before telephones, before TV, before the web, these women mobilized masses of people in a widespread and colorful campaign. Their successful tactics continue to shape campaigns today, even if many organizers have no idea where those tactics originated. But no, this couldn’t possibly be because of the suffragettes’ gender and the utter lack of historical study on women’s issues until just a few decades ago… hmmm. Modern history often gives the impression that suffrage was given to women by men under pressure from some small group of marginalized female activists. Of course, there was a committed core organizing crew, but that account is far from what really went down. In the late 1800s, moderate activists, such as those in the National American Woman Suffrage Association, chose to frame voting rights as a natural extension of what was then considered appropriate for women so as not to alienate potential supporters. Rather than diminishing men’s role, they argued that women needed the vote to fulfill their role as nurturers, holders of morality, keepers of culture, the heart of the household. As mothers and guardians who were considered to be more in touch with morality than men, women were positioned to call out corruption and hold the all-male politicians accountable. “Politics is housekeeping on a grand scale,” Jane Addams said at the time. The mainstream nature of the wider movement is displayed in lines from a banner carried in the parade before the 1916 Republican National Convention: “For the safety of the Nation / To the Women Give the Vote / For the hand that Rocks the Cradle / Will Never Rock the Boat!” Do you think they really meant that, or was it just brilliant PR outreach? Either way, before SignOn.org, Twitter or Facebook, these women collected more than a million signatures in pen and ink, all through hand-to-hand contact, and displayed them as they marched down Fifth Avenue in New York with 20,000 supporters and an estimated half-million people in the crowd in 1917. That’s quite a petition-delivery! This was a bold way to appeal to the mainstream, with messaging and images of women that were powerful and positive in the eyes of the public. But radical, militant suffragettes also had a critical role in expanding the venues for action and opportunities for dialogue. 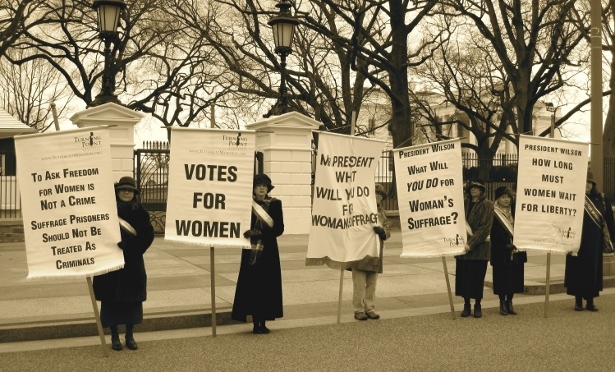 Over the 70-plus years of documented struggle for a constitutional amendment, suffrage groups activated both the mainstream and the more militant margins, splitting over disagreements about their goals — for instance, on whether or not to support the 15th Amendment against racial discrimination as a step on the path to women’s suffrage — but strategically moving toward a unified front just before the turn of the century that would enable them to win. From the beginning, the suffragettes distinguished themselves by adopting iconic colors and images. 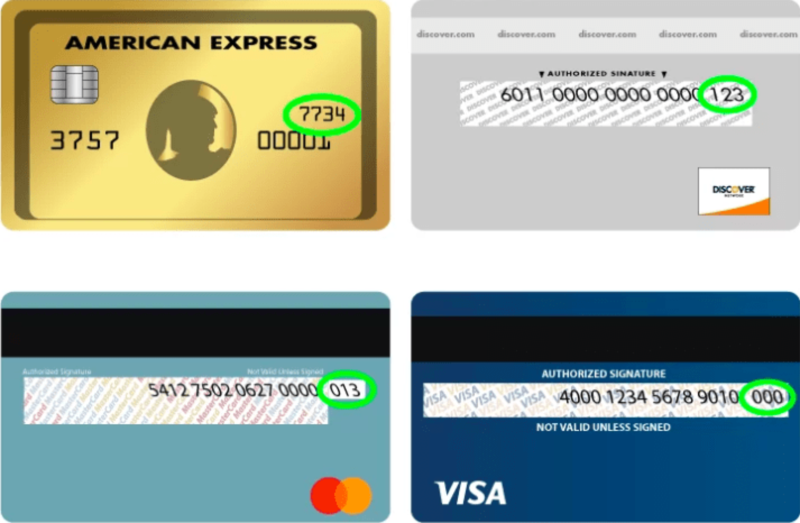 They wanted to be visible in a crowd, to distinguish easily which shop owners were supportive, to be able to speak without having to say a word. The U.S. movement used white, gold and purple for buttons, pins, sashes, flags, clothing, horses — you name it. White symbolized purity; gold, hope; and purple, dignity. Wearing white was also a way to demonstrate their purity in reaction to men hurling insults like “Any women in the streets must be women of the streets” to discredit their work. Gold derived from the Kansas state flower, the sunflower, which was used in the statewide battle there early in the campaign. It evoked sunlight and a vision of enlightenment where women and men would be equal under the law. Sunbursts were common in the backgrounds of images as well. Building movements around symbolic colors like this has been common ever since, from Iran’s Green movement, or the Rose, Saffron, or Orange revolutions, which all used this kind of effective color branding. Colors were only the beginning of the suffrage movement’s branding savvy. Allegorical and classical images of women were used commonly in American culture since the Revolutionary War, and the suffragettes embraced that. They dressed in robes at public events, personifying America, Democracy, Liberty and Justice, thus linking existing symbols of civic and social virtues to voting rights for women. Beyond the bold use of color and classic images, the women embraced huge spectacles — from long, multi-day marches foreshadowing Gandhi’s Salt March to massive pageants with costumed participants, floats and formations. To push the vote in New York state in 1912, there was a 12-day, 170 mile “Hike to Albany”; the next year, the suffragist “Army of the Hudson” completed a 225-mile walk from New Jersey to Washington, D.C. These physical stunts were part of the ”new womanhood” that showcased active, fit women in the public sphere to undermine any thoughts of women’s inferiority, physically or politically. At the time, astute writers commented that this kind of public work generated millions of dollars in free publicity for the movement, as well as immense outreach opportunities. The militant National Women’s Party took this another step further with the first-ever picket of the White House. The “Silent Sentinels” and their banners were present every day from Jan. 10, 1917, to June of 1919 — except on Sundays. More than a thousand women participated over this period. Many were arrested, were refused bail and served time in horrendous conditions of solitary confinement, where they experienced beatings and force-feeding when they went on hunger strikes. Outrage at the treatment of women activists in prison built sympathy for the suffragette cause. Also, the first arrests at the White House were eventually found illegal, which helped ensure the right to protest there to this day. In the 19th century, political parades and pageants were common in U.S. communities — for local celebrations, temperance marches or presidential campaigns passing through town. 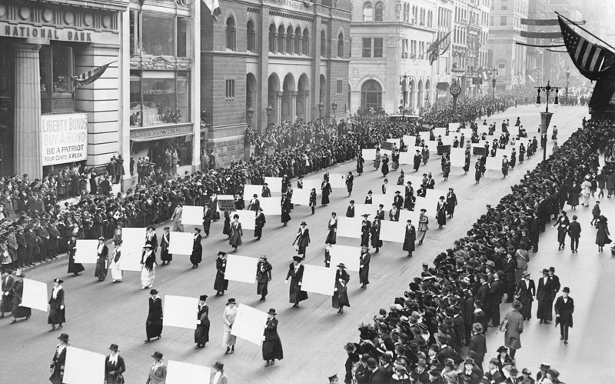 Suffragists held parades as early as 1906, beginning in California. This practice reached its peak exactly a century ago with what The New York Times called “one of the most impressively beautiful spectacles ever staged in this country.” This 1913 Woman Suffrage Procession was reported to include nine bands, four mounted brigades, three heralds, about 24 floats and more than 5,000 marchers. The march concluded at the Department of the Treasury steps with 100 women and children staging a vision of a shining future along with Justice, Liberty, Charity, Peace and Hope personified by women in flowing classical dresses and trumpets blaring. 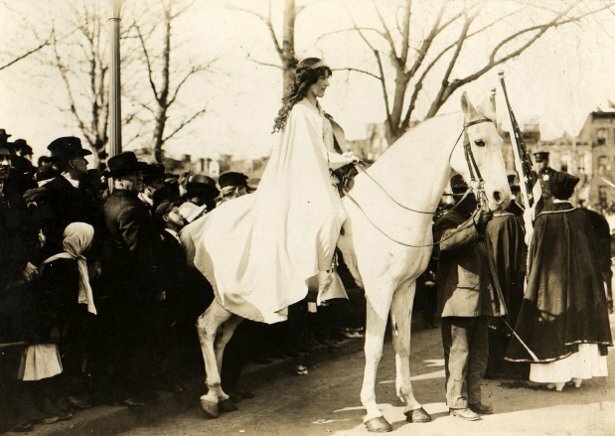 The now-famous image from this march is of a young beautiful woman in white robes on horseback, in a not-so-closeted, militant nod to Joan of Arc. Wow. Their spectrum of tactics included hotter actions, too. At one point in 1919, President Wilson was burnt in effigy in front of the White House, pitting the petticoats against the bluecoats. Wildly spewing fire extinguishers were unable to prevent the burning of the four-foot-tall cardboard Wilson. (There were about 50 arrests that day.) The suffragettes used flames again when they set “watchfires” outside the New York City opera house while Wilson was speaking there. Activists transcribed his words as he spoke them and then publicly burned the paper in public fires outside — thus condemning the hypocrisy of his words about international freedom while women were denied suffrage at home. These protests kindled more support for the women, who were steadfast, innovative and organized. They left the police looking disorganized and foolish, along with anti-suffrage minions. Many of the media stunts were timed just right — famously, President-elect Wilson arrived in Washington the day before he was to be inaugurated to empty streets, as the masses in town all were drawn to the Woman Suffrage Procession. Of course, that meant that there were many hostile observers who had come just for the next day’s inauguration — about 100 marchers landed in the hospital — but the riotous swarm and the resulting publicity led to more momentum for the campaign. Generations of American suffragettes were brave, tenacious, dedicated and incredibly talented nonviolent warriors and leaders — from Elizabeth Cady Stanton to Alice Paul. Their tactics and strategies have become such an integral part of our nation’s repertoire of civil resistance that we often take them for granted. Not only were the events innovative, courageous and spectacular, but they were intentionally executed to get attention in the media of the day — newspaper and radio, as well as early motion pictures. Some participants in the 1917 New York march recorded one-minute speeches on early Kinetophone cylinder recordings that were then played to audiences in Vaudeville houses — an ancestor of YouTube, perhaps? Ubiquitous media coverage, whether positive or negative, succeeded in helping educate and convert the public into supporters of women’s suffrage. maybe we should retire the word “suffragette,” which was at the time a term of disparagement. The women called themselves “suffragists.” “Suffragette” with its diminutive, feminine suffix -ette was intended to diminish them and render them foolish, and it was introduced into language by their opponents. Has “suffragette” been reclaimed, like so many other words originally used to deride? Or should it be put aside? I’m glad that at certain points Nadine used the word “suffragist” when she specifically wanted to include male allies. This piece has significant problems. Of course, the usage of “suffragette” is historically inaccurate, but that is a considerably smaller fault than the lack of a sustained analysis of the white supremacy that was endemic to the white woman’s suffrage movement. This is in addition to the failure to cite a single feminist of color in the piece, the neocolonial suggestion that white Americans “foreshadowed” Gandhi’s salt march, as well as the failure to analyze that equating white with purity–an entirely racist notion that is a wholesale product of the discourse of empire–might be a wee problematic. Why is it that the leading white working class feminist of the time-Mother Jones–was skeptical of suffrage, and why is it that the leading black feminist of the time–Ida B Wells–devoted all of her energy to the anti-lynching campaign, which she clearly believed was more urgent? To interrogate that would be a deeply valuable and necessary follow-up piece. Thank you for these valuable observations. I have to own that this column can’t be more than an overview of some of the nonviolent direct action tactics that were interesting to me and were used over many decades, thereby leaving more out than it included. I do so not as a well-versed scholar of the suffrage movement so much as a modern-day, grateful female activist. Naming only 4 women, as I did in this post, is quite limiting, though you are right it would have been better to include more diversity in even that tiny list. Many people do not consider Mother Jones a feminist (at all!). You are right she did not support suffrage; she apparently said you don’t need the vote to raise hell, and she mainly wanted working men to be paid enough to support their wives staying at home ( a belief said to be derived from her strong Catholic background.) Ida B. Wells was considered both a feminist and a suffragist. In fact, she founded the black woman’s Alpha Suffrage Club of Chicago in 1913, though as you mentioned, she put the majority of her life’s work into fighting lynching. I agree that hers is a valuable story to keep telling, though I’m not sure this piece was the right place to do so. It’s true that “suffragette” was more common and more accepted in Britain (reportedly coined by a newspaper and then adopted by the movement), and was, for a time, not popular in the U.S. Later, when the suffrage workers in the U.S. became more like their (more) militant British counterparts, the term “suffragette” was more common. Perhaps it might have been more accurate to say the suffragist marches “preceded” the Salt March, if that word carries less baggage. I don’t think either word diminishes the uniqueness of either historic march. Of course, Gandhi was a resourceful strategist, and he was not shy about giving credit to those in the past who inspired him, whether they were from Europe, the United States, India or elsewhere. The idea of white as symbolizing purity has been common over the history of people in many places — especially around religious rituals involving priests, funerals, and transformation of some kind. This has been true in West and North Africa, as well as in Asia and Europe. There is no denying that the U.S. was racist a century ago, as it is now, or that the suffrage movement was not without racism, but I don’t think it’s fair to fully equate the use of this symbolism with empire. In this way and others, I believe that today we can learn from and celebrate how the suffrage movement expanded human rights while being aware that it was in no way perfect. Hi Nadine, I appreciate your response. With your comment on Mother Jones- and I am asking these questions sincerely–is there a single working class woman from that era who would fit in with the traditional (bourgeois) definition of “feminist”? Is wanting the ability to stay home with one’s children somehow counter-feminist? As to the white symbolism with purity, I guess I would just simply have to disagree with you. If you look at the way the term white is deployed during that era (and today)–even in seemingly innocuous circumstances, such as soap advertisements–it is obvious that such a deployment was entirely productive of white supremacy and global European dominance. 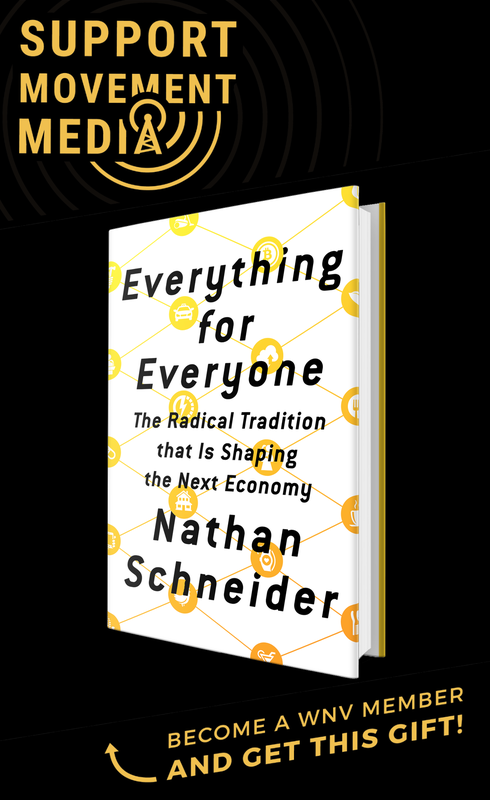 This is not a question of the continuance of long-held traditions, one of the facets of capitalism, I believe, is that it constantly creates a sense of universality of the present political situation that is in reality absolutely conditional. Finally, I’m generally skeptical of this amorphous category of human rights: is the right to vote a human right? For me human rights are the right to nutrition, shelter, health care, community, and the right to participate in one’s community. I’m fairly sympathetic to that Emma Goldman quote–”If voting ever changed anything, they’d make it illegal”. Certainly, it is difficult to argue that the electoral system in the United States is conducive in any way to such latter categories of human rights. From my perspective,if we go with a standard modern definition of a feminist as someone advocating social, political, legal, and economic rights for women that are equal to the same rights of men, then although Mother Jones was an amazing, inspirational, courageous and probably every-other- powerful- positive- adjective -you- could -use- woman, she wasn’t about equal rights for women in that way. If your choice as a man, or a woman, is to stay home with your kids, and society doesn’t accept that or you want to do something different than society accepts… you don’t have equal ‘rights’ or at least in this case, equal opportunity. About the color white– I know that there is truth in your point about white supremacy being reinforced through the equation of white and the concept of purity, pureness ( a different thing) and cleanliness ( another thing too!) As an artist and someone who is very visual and experiential in my approach to things, I found that when I lived in West Africa/Ghana that not only was black the color of fertility, of birth, of possibility ( the black earth is fertile, the birth canal is dark as black, and out of these dark places, and your mind, comes potential…) and that white was the color of death, mourning, purity and used in funeral rituals, worn by shamans and priestesses who often adorned their own dark bodies with stark white chalking, and thought to allow clearness of intention. Many traditions associated with ancestor worship and spirituality outside of the euro churches understand white in this way. It is also true that white/purity/cleanliness/pureness has been used in ways to oppress many peoples– most of them women, and people of color. But as you said, not in so many words, things are not always what they seem, especially to those outside of the impacted community and in another time. onward. Thanks for reminding us of the creativity and strategic smarts of the suffrigist/suffragette movement. To say that Inez was wearing the white cape because she was a white supremacist is contraindicated by the fact that Inez supported the rights of all women to vote. With regards to the inclusion of African-American women, I am not sure why Ida B. Wells would be a first choice to include with regards to the Suffragist movement. Ruffin or Mary Church Terrell had a more sustained involvement. One of the interesting dilemmas was Alice Paul’s dilemma in organizing the march. What would you do if the political/cultural landscape was such that you could have an European-American only march…..or none at all. As it turned out, the Delta’s (an African American Sorority) crashed the march anyway..and it worked out great. Alice made a painful decision to move forward with a March that was discriminatory!!!! !was this the right thing to do or not? No, it was not the right thing to do- it was the racist thing to do.